If you like making cakes, pastries and desserts often but feel like you’re spending too much on readymade cans of Reddi-Wip or Cool Whip, you can instead make fresh whipped cream at home for a lot less. You’ll also ensure that there’s nothing artificial in the fluffy goodness that you produce and can have flavored cream if you want. All you need is the cream and sugar or natural flavoring. The best whipped cream dispenser should produce the lightest and fluffiest whipped cream everytime it’s used. A whipped cream dispenser uses N2O (nitrous oxide) chargers that you insert into a holder in the canister and the tip gets pierced by an inbuilt needle tip. The gas is released into the cream under pressure and that’s what gives it the volume to become fluffy as it is released via a dispenser tip. You don’t have to finish off the batch of cream in the dispenser in one shot. Cream should stay in your fridge for up to 7 days. Some of these dispensers can also be used to carbonate water if you use CO2 chargers, but if that’s something you think you’ll do frequently, then get a dedicated water carbonator instead. If the cream is coming out flat or watery you may need to use more than one charger for the canister capacity. Half a pint or 1 pint will need one to two chargers, while 1 litre will need two to three chargers. You can get them for a very low cost quite easily. You’ll get between 2 to 4 times the amount of whipped cream. If the charger is not the reason, you may need to use a heavier cream. Also ensure that you shake the canister at least 6 times each time before you dispense with the lever. The shaking also helps use up all the cream with very little wastage at the bottom. If the consistency of the whipped cream is uneven, ensure that all the parts of the dispenser are clean. Unscrew and wash everything before using. The following whipped cream dispenser reviews are of the top 5 rated ones available in the market right now. If you want to look at a wider range of dispensers, you’ll find more on Amazon. For a good all round whipper, and at one of the best prices on the list, the iSi Gourmet Whip Plus will do all of your whipping tasks without a hassle and we would rate this as the best whipped cream canister to buy for home use. At only 2 pounds of weight, it is one of the lighter models here and the big difference between this and other cream dispensers is that it’s not just for whipped cream! You can use it to whip many hot and cold foods – desserts, vegetable foams, and cold soups, etc. Because this is an all stainless steel whip cream dispenser with a fixed valve, silicone charger holder and silicone gasket, it can safely be used for hot foods too. This unit is even versatile enough so that you can also use CO2 cartridges and carbonate soda. You can even outfit it with optional needle-like injection tips, to shoot cream inside of such things as cakes, pies and donuts. The red silicone collar and cartridge holder give a nice contrast between the stainless steel bottle and nozzle and are ergonomically designed. It comes with two plastic decorator nozzles and one stainless straight nozzle. The tips can be removed if you want to store the leftover cream without discharging gas. It is dishwasher safe for easy cleaning, and if there is a slight knock on this unit, the instructions are not as concise as they could be. You can also get a Gourmet Whip Plus if you’re in the UK. The iSi Profi Professional Cream Whipper is the professional use sister to the iSi Gourmet listed above. It is not quite as versatile but it is the model that professionals prefer and you’ll generally find this for a lesser price than the Gourmet. If you like the quality of whipped cream you get at Starbucks then this is the model you want because it’s what the baristas use. The all stainless steel bottle and head with a protective silicone grip is what takes it to the next level. Unlike the iSi Gourmet, this dispenser cannot be used for hot foods unless you buy an optional silicone gasket. However, the removable stainless steel valve makes this model easier to clean. You’ll only be able to make cold whipped toppings and foamed desserts with this unit and it comes with one plastic tulip tip with stainless steel thread. It weighs about 2.2 pounds, and the body is dishwasher safe. The piston and cartridge head will need to be cleaned separately, and a small cleaning brush is included. Failure to do this after each refill will cause cream to become trapped along the seal and the interior valve, and this may impart a spoiled taste into the whipped cream during future use. But if you keep it clean you’ll get high quality whipped cream every time, even better than Reddi-Wip. The iSi Profi Professional Whipper is also available in the UK. The ICO Brand 1 Pint Whipped Cream Dispenser weighs very little, which is surprising because every single part of this model is made of stainless steel, including the charger holder which used to be plastic but has been replaced with metal. The only plastic you will see in the box is for the large star decorator tip. There is also a smaller star tip and a straight tip – both metal. It is possible to make heated whips too, but the temp must be kept below 130 degrees F or the unit will be too hot to handle. You’ll need 2 chargers for best results, not only because the holder is large but also because the resultant whipped cream will turn out better. As one customer says, if you think that one charger is enough for your needs, try stuffing a cotton wad down the bottom of the holder. Get this exact model in the UK! 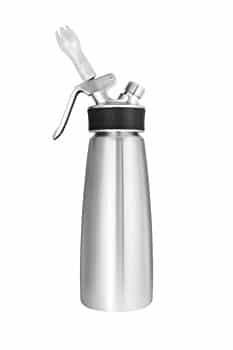 The Mosa BestWhip Cream Dispenser has a composite plastic nozzle head with a removable stainless steel piston and a brushed aluminum body that is available in a few different colors. You’ll only be able to create cold cream toppings with this unit, and at 2.2 pounds for the 1 pint, it is middle of the road for lightness. You can also choose the 1/2 pint dispenser if you don’t want to store the unused cream after using it the first time. It’s a hand wash head and dishwasher safe body. This is the least expensive whipper here, yet it is still a very competent unit even though not designed for commercial use like the other stainless steel ones. You may need 2 cartridges to get the job done in the 1 pint unit. Although not as versatile as some, if you are only looking for a good whipped cream dispenser, and you are on a budget, this one will suit your whipped cream needs perfectly. Watch out for the plastic threads seal on the charger holder. Overuse can wear it out after a while. If you think you’re going to use your dispenser a lot, invest in a model that has steel threads. Find the Mosa BestWhip on Amazon UK. The Whip-It! Brand Specialist Plus is the best dispenser from the brand that started it all. If you’re looking for one that you can use for large parties as well or to keep in the fridge longer, then a 1 litre (2 pint) model is also available. The 1 pint model is more than enough for most households and small parties. The body, piston and charger holder are stainless steel and the two decorator tips are made of plastic. The biggest knock on this whipped cream dispenser is that it requires some effort to put it all together to use. If not careful, the seal could break. make sure that the seal’s tag doesn’t come in the way of the piston while pushing it down. The Whip-It! Brand Specialist Plus is also available on Amazon UK.